Martin and Jane Cowell with parents Mavis and Alan Cowell. One of the last remaining independent garden centres in the North East has once again been named the UK’s best, after topping two categories in a national awards programme for the second-year running. 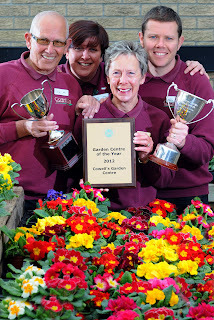 Family-run Cowell’s Garden Centre in Woolsington has been named ‘Garden Centre of the Year 2012’ by industry body the Garden Centre Association (GCA), following a judge’s rigorous inspection visit. 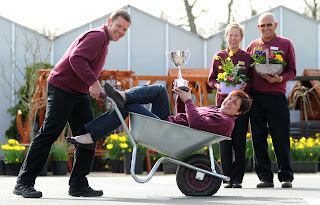 Originally opening its doors in 1978, Cowell’s is one of the few remaining independent garden centres in the region and prides itself on the breadth and variety of its plant selection, as well as giftware and garden furniture. The extensive range of plants available led to a second recent award from the GCA, the ‘Ruxley Rose Plant Area 2012’ award in acknowledgement of the quality and choice of plants on offer.